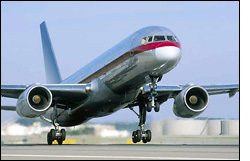 Peak air travel times in the United States see about 50,000 aircraft operating in our skies each day, not counting the tens of thousands of airborne vehicles the world over. It's no small task for the 15,000 air traffic controllers in airports across the country to prevent these aircraft from colliding into each other. To ensure the safe passage of 700 million people every year, the dedicated men and women in the air traffic industry must coordinate the movements of thousands of airplanes, from commercial airliners to cargo jets to military transports. Keeping all of these planes at a safe distance from each other, directing them during takeoff and landing at airports, and routing them around bad weather requires monitoring equipment that won't fail...because the margin for error is zero. 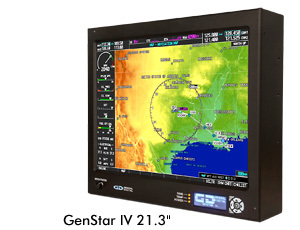 General Digital's GenStar line of mountable sunlight readable LCD monitors was designed specifically to meet the stringent optical and operational requirements of the FAA's Standard Terminal Automation Replacement System (STARS) program. 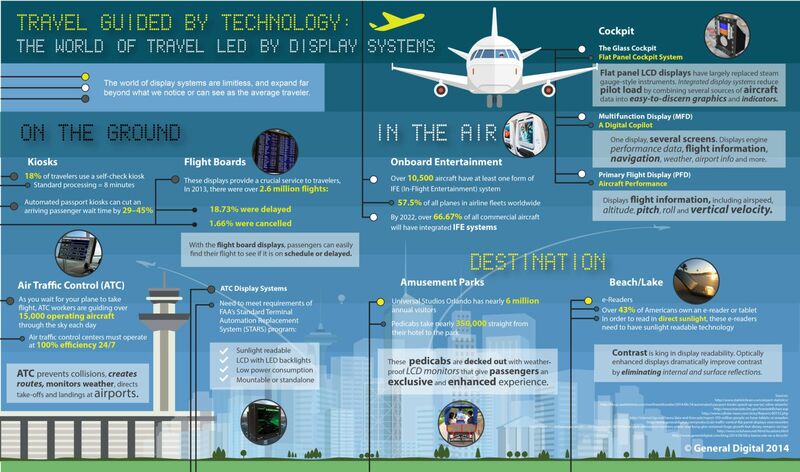 As such, our specialized displays are ideally suited to meet other Air Traffic Control Tower applications, as well. In most commercial applications, LED backlights are configured to drive their LED rails in a serial manner. While this technique is inexpensive and easy to implement, its downfall is that a single LED failure will render an entire rail inoperable—a catastrophe to mission-critical and safety-critical applications such as Air Traffic Control. The GenStar LED rails utilize a serial-parallel design whereby the LEDs are driven in groupings of four, while the LED groups themselves are driven in a parallel manner. Using this approach, a single LED failure will only affect its immediate grouping, leaving the remaining groups of LEDs unaffected and fully operational. Display Size 20.1" 19.0" 21.3" 19.0" 21.3"
*GenStar II is no longer in production. We list it here for comparison purposes only. 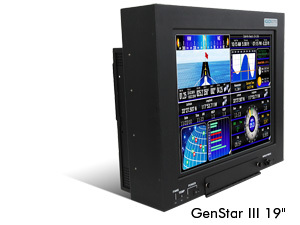 In addition to the GenStar line, our mountable standard luminance Saber Standalone and high bright Saber Standalone Solar LCD monitors, with and without touch screens, are designed to provide Air Traffic Control Specialists with static and dynamic data regarding weather and other safety-critical operational data. Our Saber Standalone family of industrial monitors are designed to be used where portable displays are required and can be carried conveniently from one location to another. Also used as video information displays for Naval air traffic control, their rugged enclosures are designed to provide years of durable service in demanding environments. While constructed to be both rugged and portable, all of our standalone monitors can also be configured in rack mount and panel mount enclosures. Saber Standalone mountable LCD monitors come supplied with mounting holes on the rear and sides of the paneling; this allows easy integration into standard or custom pedestals, yokes, cradles or articulating arms. Because there is a wide variety of mounting options available, we recommend speaking with one of our Sales Engineers to determine which mounting option best fits your application. Display Size 17.0" 21.5" 24.0"
Display Size 15.0" 17.0" 19.0" 20.1" 21.5" 24.0" 24.0"
Our rack-mounted SlimLine 1U LCD monitor/keyboard/trackball is used to provide system support and terminal weather data. Cleverly combining an LCD monitor, keyboard and trackball in one unit, the SlimLine 1U is considered the “perfect” complement to rack mount environments. Another of General Digital's rack mount products, the TwoView dual LCD monitor/keyboard/trackball is utilized in forward deployed interim air traffic management stations. Compact design and industrial durability, combined with General Digital's legendary configuration control and long product life cycles, makes the TwoView an ideal rack mount solution for all manner of air traffic management systems. General Digital builds rugged standalone and mountable LCD monitors for the air traffic control and other navigation-reliant industries. This includes the venerable GenStar, as well as several displays from our Saber Standalone family, and other rack mount units and open frame display kits. The all-metal enclosures are easily configured for rack mount, panel mount, kiosk, pedestal, articulating arm or simple desktop use. Designed to operate from a single +12 volt or 24 volt regulated source, we recommend powering our air traffic control monitors by a General Digital-designed power supply for maximum compatibility and reliability. However, power sources can be provided independently. 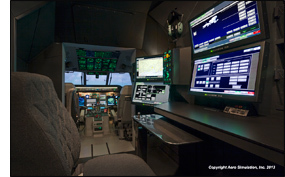 With the many options and configurations available for the air traffic control and navigation-reliant industries, we suggest speaking with a qualified Sales Engineer to determine what will best suit your needs. Complete the contact form today or call 800.952.2535 for more information.